About the Book: John Bell Hood brought a hang-dog look and a hard-fighting spirit to the Army of Tennessee. Once one of the ablest division commanders in the Army of Northern Virginia, circumstances placed him, by the spring of 1864, in the war’s Western Theater. Recently recovered from a grievous wounds sustained at Chickamauga, he suddenly found himself thrust into command of the Confederacy’s ill-starred army even as Federals pounded on the door of the Deep South’s greatest untouched city, Atlanta. His predecessor, Gen. Joseph E. Johnston, had failed to stop the advance of armies under Federal commander William T. Sherman, who had pushed and maneuvered his way from Chattanooga, Tennessee, right to Atlanta’s doorstep. Johnston had been able to do little to stop him. 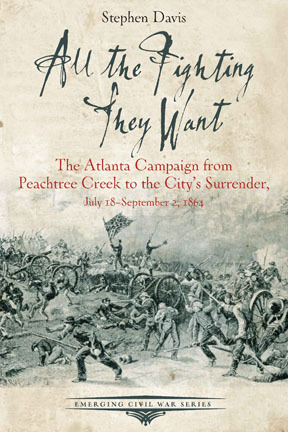 In All the Fighting They Want, Georgia native Steve Davis, the world’s foremost authority on the Atlanta campaign, tells the tale of the last great struggle for the city. His Southern sensibility and his knowledge of the battle, accumulated over a lifetime of living on the ground, make this an indispensable addition to the acclaimed Emerging Civil War series.